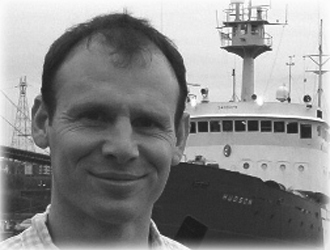 My research focuses on marine optics and its application to the interpretation of ocean-colour radiometry (OCR). The data are measured in situ (ship) or from remote sensors (aircrafts or satellites). In other words, I am interested in the fate of those photons, emitted from the sun in the visible part of the spectrum, that enter our atmosphere and reach the surface of the ocean, and then penetrate the water. Some of the photons will be reflected back into the atmosphere without interacting with the ocean. The ones that enter the ocean will either get absorbed or leave the ocean where they can be collected by various optical sensors. The ratio of light entering and leaving the ocean carries useful information about the nature of the particles and dissolved material present in the seawater. A major part of my work deals with decoding this information to retrieve important biogeochemical characteristics of the oceans. Trzcinski, M.K., Devred, E., Platt, T. and Sathyendranath, S., Variation in ocean colour may help predict cod and haddock recruitment, Marine Ecology Progress Series (accepted). Ardyna, M., Babin, M., Gosselin, M., Devred, E., Bélanger, S., Matsuoka, A. and Tremblay, J.-É., Parameterization of vertical chlorophyll a in the Arctic Ocean: impact of the subsurface chlorophyll maximum on regional, seasonal and annual primary production estimates, Biogeosciences, 10:1345-1399 2013. Werdell P.J., Franz, B.A., Bailey S.W., Feldman G.C., Boss E., Brando V.E., Dowell M., Hirata T., Lavender S.J., Lee Z.P., Loisel H., Maritorena. S., Melin F., Moore T.S., Smyth T.J., Antoine D., Devred E., D'Andon O.H.F., Mangin A., Generalized ocean color inversion model for retrieving marine inherent optical properties, Applied Optics, 52:2019-2037 2013. Brewin R.J.W., Devred E. Sathyendranath S., Lavender S.J. and Hartman-Mountford N.J., Model of phytoplankton absorption based on three size classes, Applied Optics, 22:4535-4549 2011. Devred E., Sathyendranath S., Stuart S. and T. Platt, Absorption-derived phytoplankton cell size: application to satellite ocean-colour data in the Northwest Atlantic, Remote Sensing of Environment , 115:2255-2266 2011. Brewin R.J.W., Hartman-Mountford N.J., Lavender S.J., Raitsos D.E., Hirata T., Uitz J., Devred E., Bricaud A., Ciotti and Gentili B. An intercomparison of bio-optical techniques for detecting dominant phytoplankton size class from satellite remote sensing, Remote Sensing of Environment, 115:325-339 2011. Jackson T., Bouman H.A., Sathyendranath S. and Devred E., Regional-scale changes in diatom distribution in the Humboldt upwelling system as revealed by remote sensing: implications for fisheries, ICES Journal of Marine Science, 68(4):729-738 2011. Zhai, L., Platt, T., Tang, C., Sathyendranath, S., Fuentes-Yaco, C., Devred E. and Wu, Y., Seasonal and geographic variations in phytoplankton losses from the mixed layer on the Northwest Atlantic Shelf, Journal of Marine Systems , 80:36-46 2010. Platt T., Sathyendranath S., White G., Fuentes-Yaco C., Zhai L., Devred E. and Tang C., Diagnostic Properties of Phytoplankton Time Series from Remote Sensing, Estuaries and Coasts , 1559:2723, doi:10.1016/j.rse.2007.11.018, 2008. Platt T., Sathyendranath S., Forget M.H., White G., Caverhill C., Bouman H., Devred E. and Son S., Operational estimation of primary production at large geographical scales, Remote Sensing of Environment , 112:3437,3448, doi:10.1016/j.rse.2007.11.018, 2008. Nair A., Sathyendranath S., Platt T., Morales J., Stuart V., Forget M.H., Devred E. and Bouman H., Remote sensing of phytoplankton functional types, Remote Sensing of Environment, 112:3366-3375, doi:10.1016/j.rse.2008.01.021, 2008. Wu, Y., T. Platt, C. C.L. Tang, S. Sathyendranath, E. Devred, and S. Gu, A summer phytoplankton bloom triggered by high wind events in the Labrador Sea, July 2006, Geophysical Research Letter, 35, L10606, doi: 10.1029/2008GL033561 2008. Forget M.H., Sathyendranath S., Platt T., Pommier J., Fuentes-Yaco C. and Devred E., Computation of Primary Production From Remote-Sensing of Ocean Colour at the Lagrangian site of C-SOLAS, Marine Ecology Progress Series, 352:27–38, 2007. Devred E., Sathyendranath S. and Platt T., Delineation of ecological provinces using ocean colour radiometry, Marine Ecology Progress Series, 346:1-13, doi: 103354/meps07149, 2007. Devred E., Sathyendranath S. and Platt T., Relation between the Q factor and inherent optical properties: Relevance to oean-colour inversion algorithms, Geophysical Research Letters, 34, L18601, doi:10.1029/2007GL030764, 2007. R. Barlow, V. Stuart, V. Lutz, H. Sessions, S. Sathyendranath, T. Platt, M. Kyewalyanga, L. Clementson, M. Fukasawa, S. Watanabe, E. Devred, Seasonal pigment patterns of surface phytoplankton in the subtropical southern hemisphere, 54:1687-1703, Deep Sea Research I, 2007. Platt T, Bouman H., Devred E., Fuentes-Yaco C. and Sathyendranath S., Physical Forcing and Phytoplankton Distributions, Scientia Marina, 69(Suppl. 1), 55-73, 2005. Fuentes-Yaco C., Devred E., Platt T., Sathyendranath S., Forget M.H. and Son S. H., Principes physiques et interpretation de la reflectance spectrale marine (la couleur de l''ocean) : applications aux donnees satellitaires, Physics in Canada, Vol 61(5), pp15-26, 2005. Devred E., Fuentes-Yaco C., Sathyendranath S., Caverhill C, Platt T. and Mass H., A semi-analytical, seasonal algorithm to retrieve the chlorophyll-a concentration in the Northwest Atlantic from SeaWiFS data, Indian Journal of Marine Sciences,Vol 34(4), Special issue, pp. 356-367, 2005. Fuentes-Yaco C., Devred E., Sathyendranath S., Platt T., Payzant L., Caverhill C., Porther C., Maass H. and White G. N., Comparison of in situ and remote sensing-derived (SeaWiFS) chlorophyll-a in the Northwest Atlantic, Indian Journal of Marine Sciences,Vol 34(4), Special issue, pp. 341-355, 2005. Sathyendranath S. Watts L., Devred E., Platt. T. Caverhill C. and Maass H., Discrimination of diatoms from other phytoplankton using ocean-colour data. Marine Ecology Progress Series, 272:59-68, 2004. Devred E., S Sathyendranath and T. Platt, Utilisation de la télédétection spatiale pour distinguer les diatomées dans un population phytoplanctonique en milieu océanique, AZMP bulletin PMZA, 4 :41-44, December 2004. Devred E., Fonlupt C., Santer R. and Robilliard D., Genetic algorithm to derive the diffuse attenuation coefficient from water leaving radiances in ocean cas-2 waters, in Proc. of the 46th annual meeting on Int. Symposium on Opt. Science and Techniques: Airborne and in-water underwater Imagery II, San-Diego, USA, vol 8844(37), 2003. Devred E., Dubuisson P., Santer R., Computation of spectral irradiances in the water column using remotely-sensed data, Ocean Optics XV Conference, Prestige Publishing, 2000. Devred E., Sathyendranath S., Dubuisson P. and Santer R., Validation of an accurate radiative transfer code dedicated to the calculation of PAR in the ocean, IRS 2000: Current Problems in Atmospheric Radiation, Smith and Timofeyev (Eds. ), Deepak Publishing, pp. 369-372, 2000. E. Devred, Dubuisson P. and Chami M., Radiative Transfer code: Application to the calculation of PAR, JGOFS International Scientific Symposium: Biogeochemistry of the Arabian Sea : Synthesis and modelling. Participation to the training course: Biogeochemical Modelling of the ocean, Bangalore, India, 1999.